Enjoy merrymaking and musical entertainment on a 13-mile round trip by steam! Enjoy the live music of the Pennyroyal Jazz Band together with the sight, sound and smell of a working steam locomotive. The evening starts at 6pm when the band plays on the station platform. The train departs at 7pm with the musical entertainment continuing on board throughout the evening. A great event for groups or smaller parties, the on board bar will be open, and a fish and chips supper is included in the price. 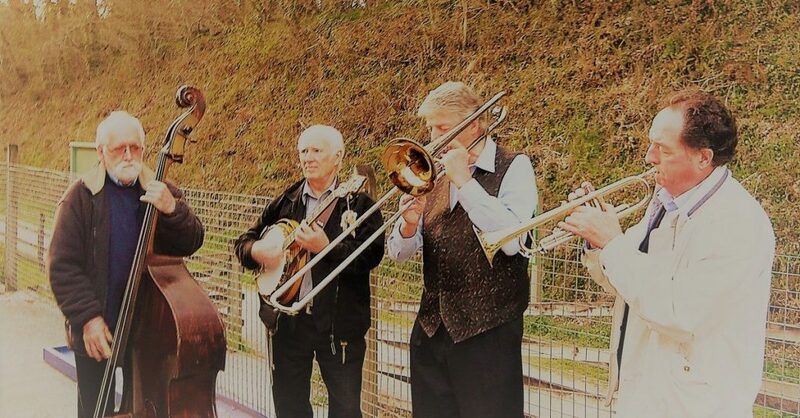 The Pennyroyal Jazz Band, formed 18 years ago by drummer Bill Sweet, are a highly entertaining traditional jazz band based in Cornwall, who play in a relaxed New Orleans style. The band play at various Cornish venues and jazz weekends across the West Country and have hosted our popular Steam, Beer and Jazz trains since they were first introduced. The band also feature regularly at Bude Jazz Festival and Plymouth Jazz Club. They’re fronted by Graham Trevarton on trumpet together with Bob Manuel on trombone and Gordon Stafford on clarinet. The banjoist is John Baker and Dave Whitcomb completes the line-up on sousaphone. More information about the our Father’s Day Weekend and China Clay weekend will be coming to our events page soon! Book by telephone on 01208 73555 or online. Catering: Don’t forget to tell us your food preference at the time of booking – your ticket includes fish/sausage/veggie burger and chips.